It’s interesting how NFL quarterback evaluation and perception work. If you win a Super Bowl early in your career, you are classified a “winner,” and it is left at that, with nothing more needed to be said. Very often, continuing (and realistic) evaluation diminishes, or even ceases, because what more need a quarterback do than win a Super Bowl? This brings me to Ben Roethlisberger. Roethlisberger, the third quarterback selected in the 2004 NFL Draft, after Eli Manning and Philip Rivers, started his first NFL game in late September of his rookie season. He did not lose a regular season start that season. He followed that in 2005 with nine wins in his 12 starts, culminating in four playoff wins and a Super Bowl championship. If you include the 2004 and 2005 postseason, Roethlisberger won 27 of his first 31 NFL starts. 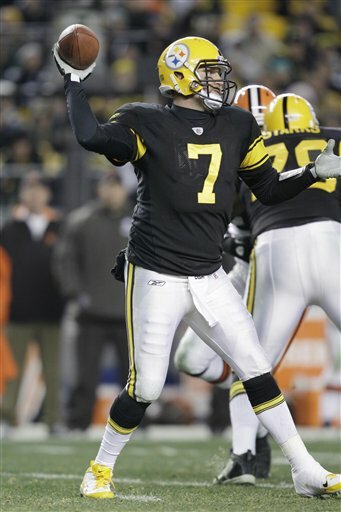 The Steelers beat the Seahawks 21-10 in Super Bowl XL in Detroit. Other than the fact that the NFL title was on the line, it was not a very compelling game. Roethlisberger, by his own admission, played poorly. The argument could easily be made that it was the worst performance by a winning quarterback in Super Bowl history. That was seen as irrelevant. The Steelers won and Roethlisberger was the quarterback — case closed. Roethlisberger’s win-loss mark is extraordinary. He has prevailed in almost 71 percent of his regular season starts. His playoff record is 10-4, with two Super Bowl titles. Yet I would submit that few quarterbacks have shown as much improvement over the course of their careers as Roethlisberger. It’s easy to overlook that because of his early success. There’s a second consideration at work here, and it may be just as important. I’m referring to the manner in which Roethlisberger so often plays. There has been an unconventional element to his style, and that element resonates. It’s a sandlot, make-it-up-as-you-go approach that is both original and spectacular. Much of it derives from Roethlisberger’s unparalleled physical strength; he is just plain ol’ country strong, with the ability to shed pass rushers and get in a position to make throws. There might be no better example of this than a play Roethlisberger made in the regular season in 2008 against Jacksonville. He had defenders hanging all over him and was still able to deliver an accurate throw to Hines Ward. What made it even more memorable was it came on third-and-8, late in the fourth quarter, with the Steelers trailing by a point. They won the game, of course. For many, that single play was the definitive snapshot of Roethlisberger’s career portfolio: what he’s capable of physically and the competitiveness with which he plays, especially in the fourth quarter. I remember vividly, in my preparation for Super Bowl XLIII, watching all of Roethlisberger’s throws from the previous two years, 2007 and 2008. At that time, in late January of 2009, I formed a strong view after hours and hours of film study: Roethlisberger was a fantastic player at times, but his game was uneven. A quick point to provide context. There are two distinct parts of every play: the pre-snap phase, when the quarterback is at the line of scrimmage, appraising the defense, waiting for the snap; and the post-snap phase, which of course occurs after the ball is snapped. The defense, in simple terms, is trying to minimize the quarterback’s capacity to understand and isolate what he’s seeing before the snap. If you don’t get a clear picture before the snap, it’s much more difficult to be consistently successful. In January 2009, Roethlisberger was not very good before the snap. One of the reasons he moved as often as he did was his inconsistency in recognizing blitz concepts at the line of scrimmage. He was still processing information, trying to decipher the defense during his drop into the pocket. You cannot be controlled, decisive and precise as a quarterback playing that way. It was the singular reason Roethlisberger had such a strong tendency to play sandlot football. The best way to portray Roethlisberger at that point in his career was this: When his pre-snap read was correct, he was outstanding, delivering with rhythm, timing and accuracy. When the picture was a little cloudy and muddied, his predisposition was to rely on his instincts. Roethlisberger was more of a reactionary quarterback, responding to (and countering) the defense after the snap with his strength, exceptional movement ability and extraordinary downfield vision on the run. Gradually over time, Roethlisberger has gotten better and better. He’s more aware before the snap of the ball, and he’s more disciplined in the pocket. While he still has the ability to impress with his idiosyncratic combination of physicality and movement, his game is now less arbitrary, less random, more structured, and therefore more consistent. This is rarely acknowledged, however, because there has been no clear quantifiable means by which to measure the progress. The Steelers still win and Roethlisberger still makes plays. As I said earlier, case closed. End of discussion. That misses the point entirely. One part of Roethlisberger’s improvement for which he does not get enough credit is his ability to make throws consistently from the pocket. It sounds strange to say that, because that’s the essence of NFL quarterbacking: delivering from the pocket. Yet the continued emphasis on his distinctive style has led many to disregard his pocket passing. I charted all 60 of Roethlisberger’s pass plays of 20 yards or more in 2011. Only five of them came outside the pocket. Time and again, Roethlisberger exhibited one of the most essential attributes necessary to play at a consistently high level: the ability to stand in the pocket in the face of pressure and deliver the ball with accuracy. That’s an element of his play that often gets overlooked. It shouldn’t. Roethlisberger has a natural ability to throw with just the right amount of touch. Does he have a strong arm? Yes. But I would contend that he is more of a finesse passer with power than a pure arm-strength passer. The difference may be subtle, but it’s significant. It’s one reason he has the ability to throw from different platforms, without his feet always being set and on balance. Overall, few quarterbacks in the NFL have Roethlisberger’s throwing skill set. In his early years, Roethlisberger was an instinctive, intuitive player who was special at times, but who had sandlot tendencies that limited his consistency. Now, after eight years as the Steelers’ starter, he’s a far more mature, disciplined quarterback. That will only lengthen his career. Will we continue to see those signature plays that have defined his career? Certainly. But my guess is we’ll see fewer of them, because he’s a better overall player. For more thoughts by Greg Cosell, follow him on Twitter.